My client, hereby referred to as Big Financial Group*, needed to redesign the enrollment process for their supplemental life insurance products. "How can we increase conversion during the life insurance enrollment process?" One of the biggest challenges facing the Big Financial Group* was increasing conversion during the enrollment process for life insurance. 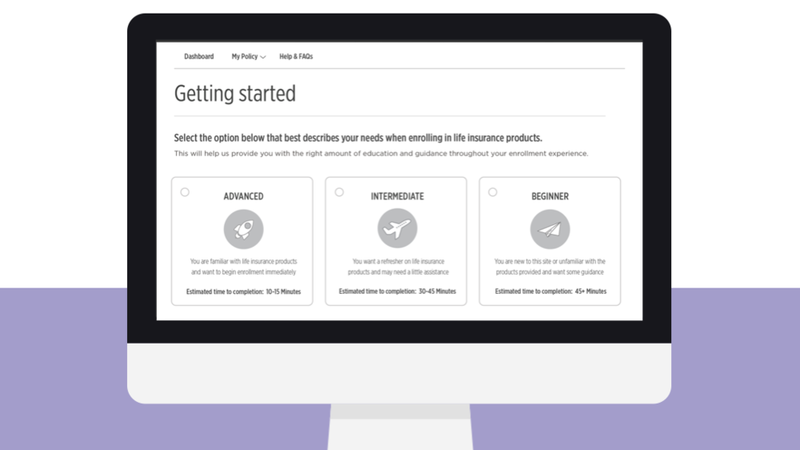 They wanted to educate users on why supplemental life insurance was helpful and to make the process easier so more users would purchase their products with confidence. "I never really know how much life insurance I need. Do I actually need it? Or is it a waste of money?" One of the biggest challenges users faced was understanding the value of supplemental life insurance, determining the correct amount of life insurance to purchase, understanding how insurance elections impacted their paycheck, and how to actually enroll for the products. In the current state of the website, all of these tasks proved to be quite complicated and difficult to navigate. Why do this? How much will it cost? Over the course of the engagement, the team interviewed 20 users through both generative and evaluative user interviews and tests. We asked them questions about their experiences with the current website, as well as asked them to quantify their experiences with a System Usability Scale Questionnaire (SUS). Taking insights from the data, we redesigned the enrollment process and retested the designs through a prototype in Invision. Once again, we asked users to quantify their experience with the SUS score. The following are the main 3 themes uncovered through the 20 interviews conducted. These pain points were especially important for participants who self-identified as being “cost conscious” while enrolling for life insurance. For that reason, the redesigned concept readily shows the cost vs. coverage to address user pain points. Additionally, our user interviews uncovered a need for transparency in the system. There are several instances where users voiced feeling uncomfortable, distrusting or confused when certain questions were being asked. Additionally, users want increased transparency regarding the actual system, including the time to completion, progress bars and ability to return at a later point. For that reason, the redesigned concept clearly communicates with the users, especially at points of high confusion. Through initial user interviews, it was discovered that users wanted to input information (i.e. household number, finances, goals, etc) and have the system recommend the best coverage options and coverage amounts for the user. All participants in the concept tests also indicated that they would answer questions up-front if that inputted data would enhance their experience later with customized information and recommendations. . Finally, a theme Effective discovered through user interviews and concept testing was the need for accessible education throughout all steps of the enrollment process. Users voiced their concerns about enrolling for products that they did not feel comfortable or knowledgeable about. Creating a educational, personalized, and reassuring enrollment process for users of all knowledge levels. From the research, I created the strategy behind WHAT the "Guided Experience" would look like and WHY this was a huge win for both the business and the user. This is a visualization of the high-level flow that a user could take throughout the enrollment process. I used data from the research to determine the final flow of the pages, and worked with a visual designer to create this final visual output. A guided experience to empower individuals to make their own choices. To clearly communicate our research, design solutions, and future considerations to the client, I wrote and created the final deliverable of design annotations to the client. This document clearly outlines each element of the design, UI interactions, major user flows throughout enrollment, and important areas and opportunities for future testing and design.